To the host Mr. Luiz Santilli, Jr and to all members of today's flowers good day to all of you. I took this lovely yellow flowers during my second visit at Niagara falls. While I took pictures of the impressive and authentic famous falls my eyes caught this ever attractive flowers. I didn't hesitate to capture and decided to post it here. 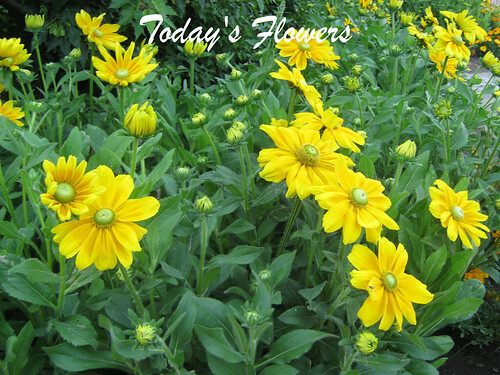 Very pretty yellow flowers! I posted yellow too. I love yellow flowers. Thanks for sharing yours. What bright sunshine yellow! They are very pretty! These are beautiful... where your page loaded I saw this flash of yellow which was stunnig... and besides it was a beautiful smiles from you.... I felt cheered on this grey day in England to see smile and flowers side by side. These are very beautiful, golden flowers as a colourful season approaches. 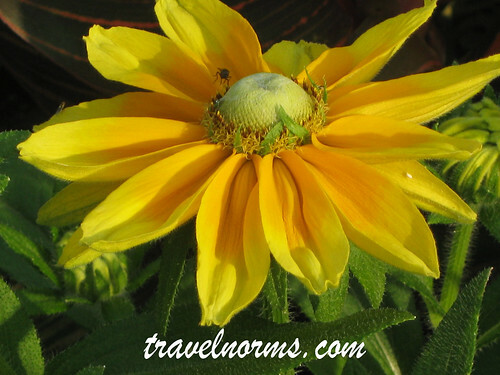 Norm: A beautiful showing of this great yellow flower. Very nice post. I think I missed it earlier. These are gorgeous and I like how there are two shades of yellow. How clever of you to spot these too! Hi Norm! That is true, those flowers are in the Phillipines too! Yes, they are good for breathing problems I think. Your yellow flowers are so beautiful, I love them. These are beautiful - their petals look so delicate. Quel est le nom des fleurs ? A beautiful field florido.excelente macro and intense colors high. Thanks for sharing. Great post in TODAY'S FLOWERS! Thanks for participate, your presence is very important in TF. Hope you come back every week!